Ready to increase your appointment bookings with Google My Business? Many medical practices today are finding themselves stuck using traditional marketing channels—such as yellow pages, print advertising, or direct mail campaigns—and are wondering why their marketing efforts are falling flat. Others have transitioned digital marketing methods, but may not be maximizing their efforts by missing out on subtle, simple changes—a checkbox here or adding a line of text there—that can be easy to miss because they seem so insignificant. Recently, Google rolled out a several new features for healthcare providers on Google My Business that offer quick and relatiely simple ways to provide searchers the information they need and to increase appointment bookings for your practie. 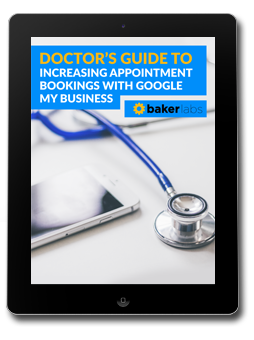 To help practices understand and implement these features successfully, we've compiled a Doctor's Guide to Increasing Appointment Bookings with Google My Business. Request a copy today!